As we all know, over-stocking causes stress on stock, pastures, soil and in the long term bank balances. Estimating the carrying capacity of your land and stocking according to it reduces these risks. There are two main types of carrying capacity—long-term carrying capacity or short-term carrying capacity, otherwise known as forage or dry season pasture budgeting. Both involve matching pasture supply to cattle feed intake requirements. It is common practice to estimate the amount of feed that will be available over the dry season for stock and adjusting stocking levels in April or May, i.e. going into winter. A dry season pasture budget aims to estimate feed available for the dry season and compares it with estimated feed intake of the cattle. It should also allow for the return of organic matter to the soil for healthy pastures and pasture consumed by native and feral animals. The two methods described below provide a guide that can complement your current approaches for setting stocking rates. One simple approach is to estimate standing feed using photo standards specific to your pasture system. Figures 1 and 2 are examples of photo standards for black speargrass in south-east Queensland. A full range of photo standards is available in the Stocktake workshop manual. The Stocktake workshop, including the manual, costs only A$300. For more information about the workshop contact Kiri Broad. 1. 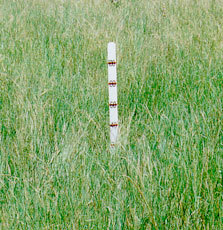 Estimate the amount of pasture available using the appropriate photo standard for your pasture type. 2. On the Safe Stocking Rate Calculator draw a line joining the class of cattle to be grazed and the amount of pasture available. 3. 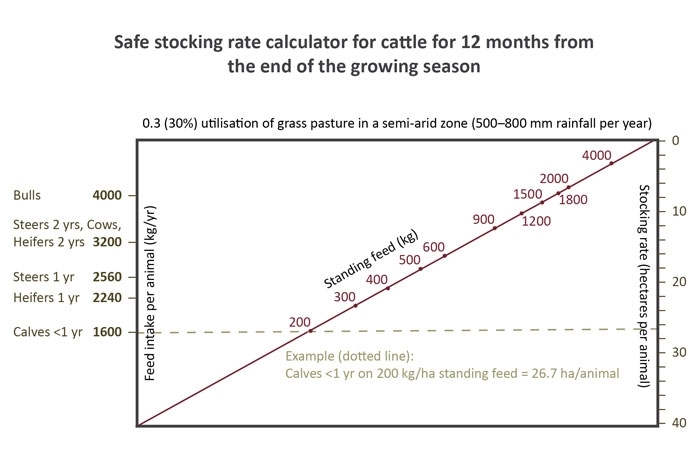 Continue this line to the right axis and read off the Safe Stocking Rate Calculator. Using the photo standards the pasture on offer is estimated to be 2,500kg/ha. The cattle to graze the paddock are two-year-old steers. By joining these two points on the Safe stocking rate calculator the safe stocking rate is one steer to four hectares. 1. Cut, dry and weigh pasture samples of a representative area and calculate ‘kilograms per hectare’. See the text box for details. This example arrived at 2,900kg of dry matter per hectare. 2. Consider how much of the pasture will be useful to stock, allowing for unpalatable species. For example, assume 80% of the pasture is useful, so 80% of 2,900 = 2,400kg. 3. Estimate a utilisation figure to allow for pasture health, competition from other animals, return of organic matter to the soil, stock trampling, etc. Generally utilisation is about 30% for native pastures and 40% for sown pastures. For example, 30% of 2,400kg/ha = 720kg dry matter. This is the amount of pasture available per hectare to be eaten by stock. In more fragile native pastures, or if you are planning to burn reduce the utilisation figure, to leave more grass. 4. Estimate the budget period, for instance the number of days from the end of effective rainfall in autumn to the start of effective rainfall the following spring. For example, a dry season from the end of May to the end of November is 210 days. You can use past rainfall records to estimate when you can reliably predict rainfall in quantities over 30mm. You may choose to be more conservative and allow for the latest recorded start for reasonable spring rains. The Rainman package can help predict these dates. 5. Estimate stock intakes. Stock intakes vary considerably with the size of the animal, the digestibility of feed and the animal’s stage of production, such as growing, pregnant or lactating. Young animals eat a higher percentage of body weight than older stock. As a guide, cattle eat about 2.5–3% of body weight in dry matter on highly digestible feeds such as fresh pasture and grain and as low as 1% of body weight on poor feeds. Providing a supplement that supplies the nutrient(s) that is limiting production will increase intake. Consider a 450kg beast that maintains its weight over the dry season and consumes 1.8% of live eight per day. 1.8% of 450kg = 8kg dry matter per day for 210 days = 1,700kg dry matter per head. 6. We have estimated a supply of 720kg dry matter on one hectare and demand of 1,700kg dry matter per head per dry season, so 1,700kg demand divided by 720kg supply = 2.4ha. This is the area needed per beast to provide 1,700kg dry matter. A 50ha paddock under this scenario would support 20 head (50 divided by 2.4ha). 1. Select a sample representative of the average paddock situation. 2. 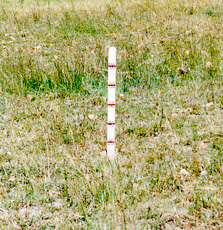 Use a 50cm x 50cm square (¼m²) quadrant to cut five pasture samples close to the ground. 3. Weigh each sample. This is the fresh or ‘wet matter’ weight. 4. Dry a sample in the oven or microwave to get a dry matter weight. Weigh the sample periodically. When the sample no longer loses weight after a drying process it is dry. If using a microwave include a glass of water in the oven to avoid the grass catching on fire when it becomes very dry. 6. Calculate dry matter: If a sample weighs 100g fresh and 80g dry, it is (80 divided by 100) multiplied by 100 = 80% dry matter and the remaining 20% is water. 8. To convert from grams per quarter square metre (g/¼m²) to kilograms per hectare (kg/ha) multiple by 40. There is 72.8g in ¼m², so there is 72.8g x 4 = 291.2g per m² x 10,000m² in 1ha, then divide by 1,000 to get kilograms = 2,912kg dry matter per hectare. Roger Sneath, Department of Agriculture and Fisheries.